Not just ornamental – you can walk across these sturdy, functional bridges! Handcrafted in Pennsylvania by an Amish craftsman, this decorative and weight-bearing cedar bridge is a great complement to a garden plot or yard! This beautiful acorn garden bridge works well for defining your lawn, accenting your garden, or crossing a stream or water feature. Because of the inherent characteristics of wood as a material, this bridge may include knots and other natural blemishes. While these products are skillfully crafted, all wood products will include natural variations such that no two bridges will be identical. 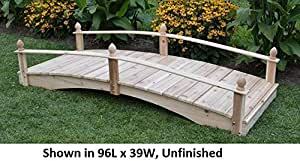 This 96″ long bridge is finished with an all-natural, eco-friendly soy-based stain.